On Canada’s 150th birthday, George celebrated one year of sobriety. His journey to this milestone has been a long and winding one, but he’s thankful to you and The Ottawa Mission for his success. George is 61 and was born in Cape Anguille, Newfoundland, once a bustling fishing village near Port aux Basques where he was a commercial fisherman for most of his younger years. When the cod fishery collapsed in 1992 most people in Cape Anguille, George included, lost the only livelihood and sense of community they’d ever known. Some turned to alcohol to ease their pain, and George was one of them. Over the years, as George travelled the country searching for sobriety and work, he stayed in shelters in pretty much every major Canadian city. 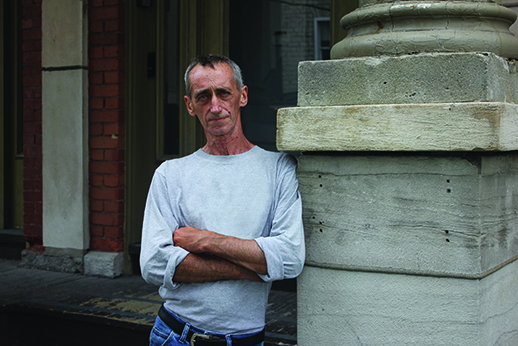 He says it wasn’t until he arrived at The Ottawa Mission that he finally got the help he needed. George’s own journey led him through the full range of addiction treatment available at The Mission, from the Day Program (a daily drop in session) through the Hope program, and Stabilization, and on to our five month residential LifeHouse program. We also helped George access a Custodial Skills training program where he renewed his certificates in Health & Safety, First Aid and CPR. Today George is living in one of our 2nd Stage transitional houses while he works part time, helps out his elderly neighbour with her yard work, and continues his recovery. As George says, “I wouldn’t be here today without the wonderful staff at The Mission and the people who support their work.” Fair sailing, George!